Is working for Toyota really good for your health? Toyota found that the Prius was worse than average for its class of vehicles in emissions of nonmethane hydrocarbons and particulate matter. TOKYO -- Working for Toyota Motor Corp. might actually make you healthier. Both smoking rates and obesity levels have come down among Toyota employees over the past four years. Last year, 36 percent of its Japanese work force lit up the occasional cigarette, compared with about 42 percent in 2006. At the same time, the percentage of workers with a body mass index over 24.2 -- a common measure of obesity -- had dropped to 24.7 percent from 28.5 percent. 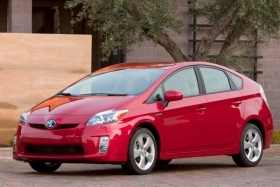 These are just two outtakes from the automaker’s recently released 2010 Sustainability Report, which outlines Toyota’s latest efforts to be environmentally friendly and socially responsible. Toyota attributes the health improvements to company campaigns to curb consumption of tobacco and junk food. Toyota pledged to step up the promotion of exercise in the workplace this year. Indeed, anyone visiting the company’s global manufacturing and engineering campus in Toyota City around lunchtime might be forgiven for assuming a marathon race was on. The sidewalks are often crammed with workers doing their daily jog. Other interesting tidbits from the Sustainability Report include Toyota’s use of snow-powered air conditioning and the surprising truth about the Prius hybrid’s life cycle environmental impact. At Toyota’s plant on the northern island of Hokkaido, where the brutal winter resembles Minnesota’s, the company is using tons of snow to cool air for its buildings in summer. In 2009 alone, Toyota piled up 3,300 tons of snow around the plant and covered it with a thick, insulating blanket of wood chips to keep it fresh through the following summer. The plant’s ventilation system then draws outside air through the snowbanks to bring down the air temperature. The process, dubbed snow/ice hybrid cooling, brings outside air of 68 degrees down to 54 degrees. Toyota says that last year, the technique reduced carbon emissions by 10 tons compared with traditional ventilation and saved about ٳ million ($12,200) in air-conditioning bills. Toyota’s more famous hybrid technology -- the popular Prius gasoline-electric vehicle -- is the focus of another entry on the car’s total environmental impact from factory to junkyard. Not surprisingly, the fuel-efficient Prius was better than average for its class of vehicles in emissions of carbon dioxide, nitrogen oxide and sulfur oxide, according to Toyota. But it was worse than average in emissions of nonmethane hydrocarbons and particulate matter. Toyota says this is because producing special hybrid-only parts such as motors, inverters and nickel-metal hydride batteries consumes more energy -- and thus churns out more emissions. In fact, when looking at the “materials manufacturing” phase of the car’s life cycle, the Prius is worse than the segment’s average across all five emissions categories. Toyota said it conducted such life cycle emissions assessments on eight vehicle series last year and used the results to help redesign such models as the Prius, Lexus RX450h and HS250h and Japanese-market vehicles including the Wish minivan and Mark X sedan.